sign up your team before June 10th!! located passed the list of show dates. Middlebrook Friesian Farm, New Haven, Vt.
East Hill Farm, Plainfield, Vt.
Vermont Morgan Heritage Days, Tunbridge, Vt. Maple Valley Stables, Westford, Vermont. Long Shadow Farm, Morrisville, Vt.
​Middlebrook Friesian Farm, New Haven, Vt. The Lippitt Country Show, Tunbridge, Vt. Directions: Rt 7 to Middlebury. In Middlebury take 30 S/Main St. Follow 30 S and signs for Porter Hospital. South Street is on the left after going through round-a-bout. Eddy Farm is 1.5 miles past Porter Hospital on both sides of the road. Parking is on left. Look for signs. 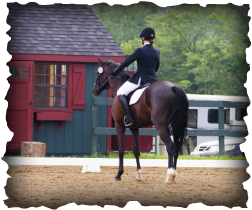 ​x-country course description (open for schooling): Eddy Farm School for Horse and Rider's x-country course is located on 50+ acres of various terrain. Natural shelves, hills, and drops, make it an ideal course for the beginner but offers enough terrain and height to entertain the most skilled rider. The jumps are inviting and range from cavalletti to roll tops to drops. There's something for everyone to ride. email at denlore3@denlore.com and he will mail one to you. From the South: Take I-89 North to Exit 2. At the bottom of the ramp turn left onto VT-132. At the T-intersection, turn right onto VT-14. Go 4.9 miles and turn right onto VT-110. The fairgrounds are 5.3 miles on the left. 30 Woods Hollow Rd. Essex Jct, Vt.
From Rt 15 in Essex - take Old Stage Rd. and follow for 5 miles. Entrance will be on right. From Rollin Irish Rd. - take left on Old Stage Rd. Entrance will be .3 miles on right. From Milton-Westford Rd.- take Old Stage Rd. Entrance will be 3.5 miles on left. Footing: Enclosed Sand arena with attached warm up, new footing 2018! turn right past green onto South Street, farm is 1.75 miles down the road. right onto Dakin Road. As above.